If you're looking for a cozy little ramen house to spend the day slurping and relaxing, then San Sui Tei is for you. 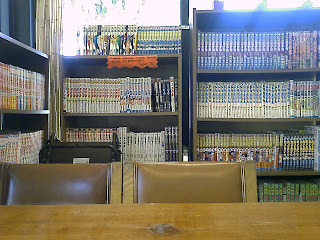 Like many "old school" japanese restaurants, there is a nice (albeit slightly outdated) selection of manga to take advantage of while you wait for your food and ponder how current advancements in nanotechnology will improve the lives of countless ramen enthusiasts throughout the universe. Okay, maybe not that last part but you'll definitely find it peaceful. Shoyu-ramen: Encircled by a deep, menacing bowl, this ramen appeared to be sitting at the bottom of a well. And with each chopstick lunge, I felt as if I was trying to rescue baby Jessica. Anyway, the shoyu-ramen was pleasant but not as impressive as I thought it would be. The soup was light and flavorful (without any oddities) and there were plenty of toppings (chashu, flavored egg, seaweed, plenty of cabbage, menma, scallions, and corn) to satisfy your hunger. The noodle texture, on the other hand, was very odd and strangely reminded me of "cup noodles." If I were blindfolded I may not have been able to tell the difference. 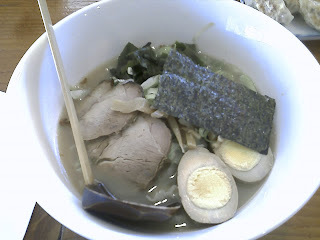 Overall the shoyu-ramen was plentiful and well presented but nothing to get too excited about. Gyoza: Instant excitement from the first bite to the last! I couldn't tell if they were homemade, but to be honest, I didn't care! 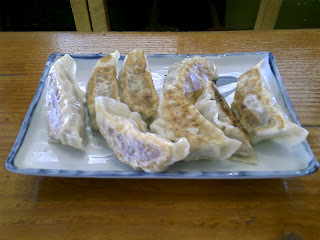 They even got me to thinking if I should start a new blog solely devoted to gyoza. Go Gyoza!?? Lol! Don't be trying to steal my ideas now. how come it looks as if the ramen is missing??? just a bowl of stuff with no noodles? 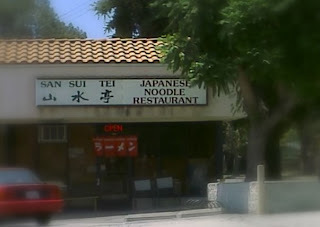 It's too bad this place is closed.